To read and write the arabic words for the hadith instead of just the english translation. 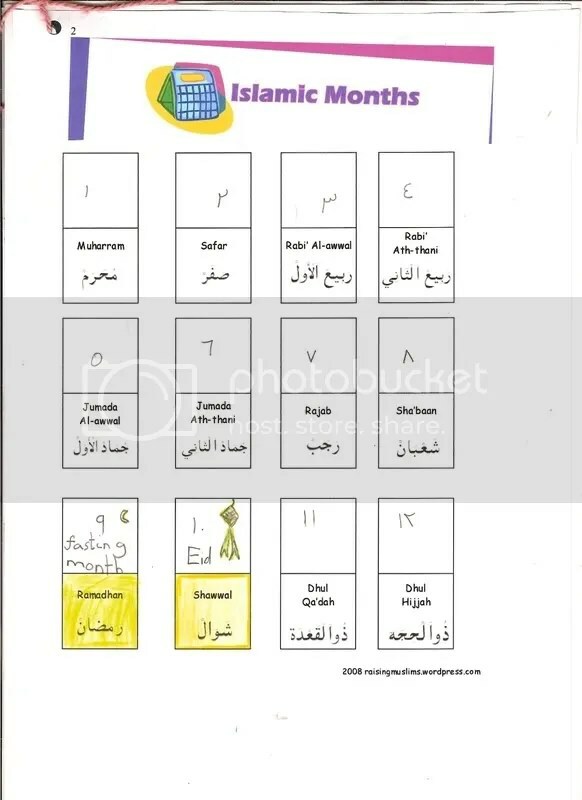 to compose quizzes on ramadhan. there is a sample HERE. but perhaps I can add more. Can you help me too? lunar watching as an everyday activity. I will have them go outside to check out the moon and paste the appropriate photo of the moon on the chart. 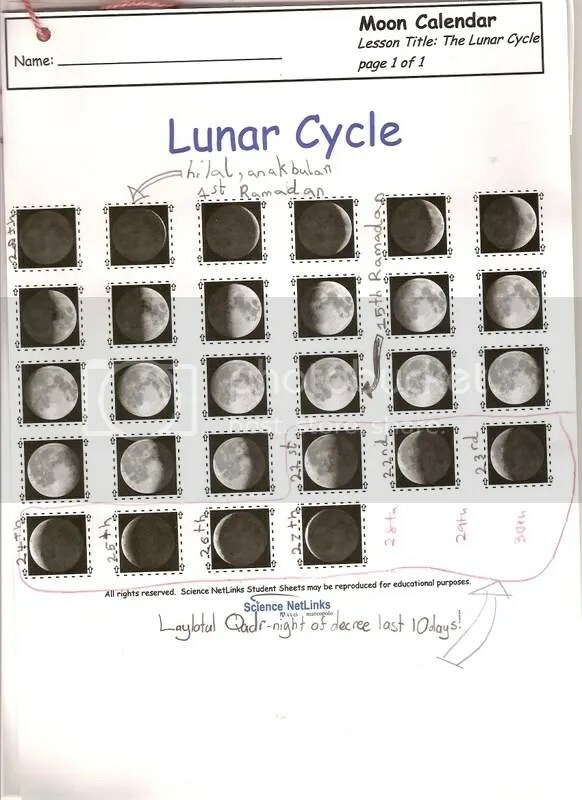 You can print the lunar worksheet if you want. Go HERE. lists more good deeds we can do. and highlight to them what they have done with praises and stars and moon. things we are grateful to Allah for and perhaps have it paste on a chart so that can see the continuous progress. be more serious about dzikir with the children. The children are reciting Subhanallah at random times. There are many ways for me to improve. 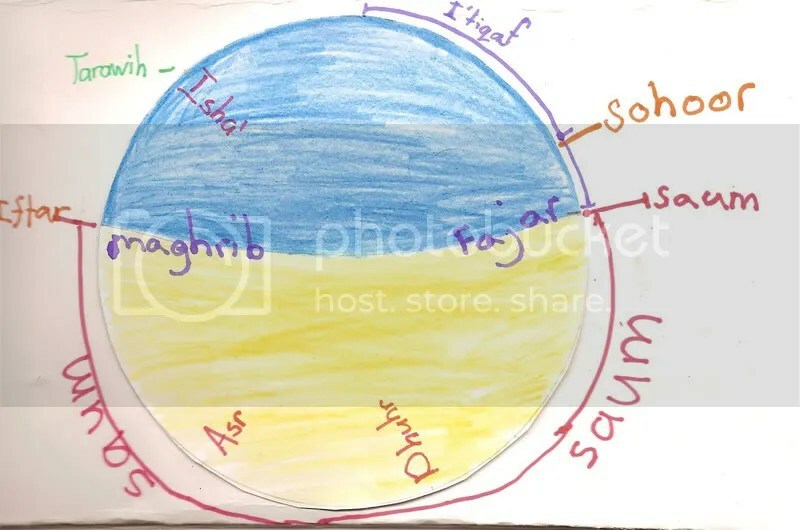 Thus, Insya Allah this lapbook can help and the children from the easy non-rocket science facts to a more serious ones for the older children. If you have older children, you can also include about qiaymulail and i’tiqaf in a more serious manner. Or perhaps a progress chart for tadarus? The ideas are vast and many. All for the sake of Allah, Insya Allah. 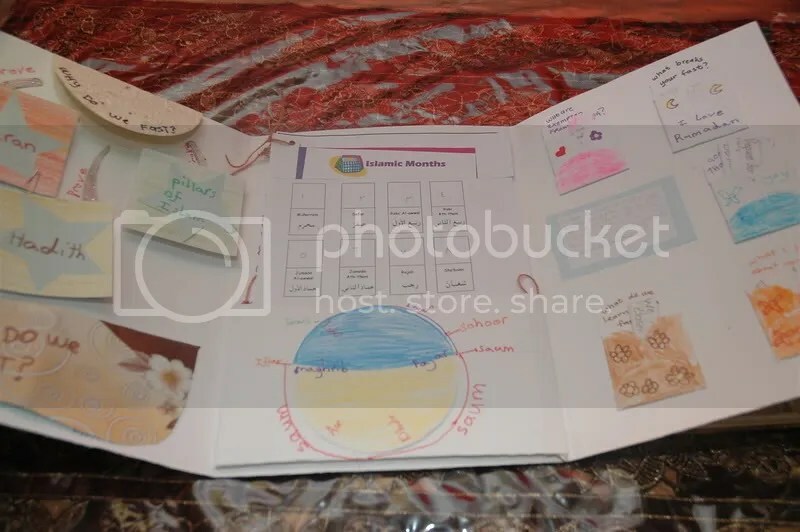 i hope this lapbook will become a treasure for them and I pray that they are kept reminded of what they learn and most of all put it to practice. Ameen. This is the third page of our lapbook. I made a few pockets. On each pocket is a question and in each pocket are cuttings of what the answers to the questions are. Haziq and Sya each had to take turn answering the questions. So they answered either by what they remembered (from our past lessons) and mostly also what we discussed impromptu. Narrated by Aishah r.a., the wife of the prophet s.a.w. : Hamza bin AMir Al-Aslami, as he used to observe saum often, asked the prophet s.a.w., should I observe saum while traveling? The prophet s.a.w. replied, you may observe saum if you wish and you may not observe saum if you wish. What do we learn from fasting? This is a slightly harder for them because they have to thinkfrom what they had actually learn. I assisted of course. This is the middle page of the lapbook. I made a pocket so we can put some material in it. The materials are as described in this post. We proceeded to explain the months of Islam, highlighting Ramadhan and Syawal. I also briefly explained that the Muslims will wait for hilal, or the moon, or anak bulan, to know when to fast and when we start our eid. We also sang the nasyid by Yusuf Islam on the Ramadhan moon. A lovely nasyid indeed. All these exercise and the song helped them tremendously I believe. Listen to the excerpt of the song HERE. Following the moon exercise, we proceeded to talk about laylatul Qadr. Again, doing this lapbook is actually a refresher of what they had been taught throughout Ramadhan. And what is best, not only they get to refresh their memory, it is really fun too! 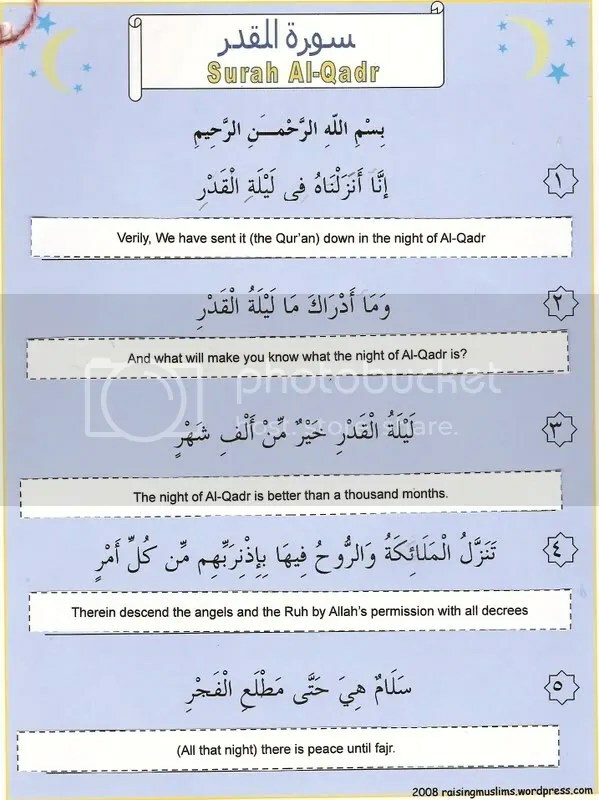 In the earlier weeks, the children were asked to memorise Suratul Qadr. 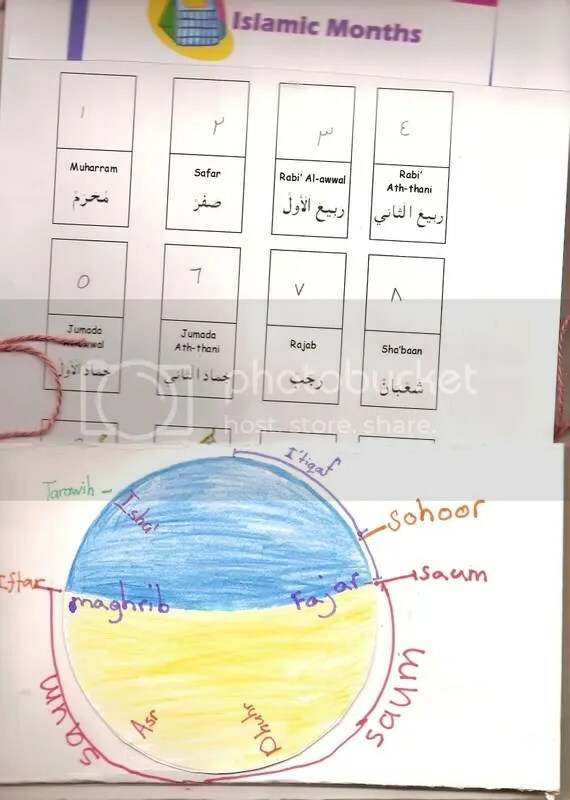 Coincidentally it was an exercise in Sya’s school too. 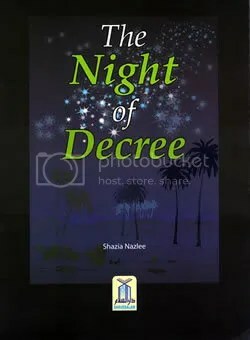 With the help of the book “The Night of Decree”, I helped explain the meaning of the surah and also talked about this night of power. Both of them were impress with the gift of such night. And seem determine to look for it at least in the odd nights. But they only manage to do it during sohoor. Next year perhaps. Insya Allah. As for Haziq, we have previously made exercise on the words of the surah. Like alf shahr. Ruh and so on. So making this lapbook, is an exercise for him since all he needed to do was paste the meaning of each verse (refer to the picture above). Doing this helped him (and me) to recite the surah better. The children recite this in their own words every night on the last ten days of Ramadhan. Alhamdullilah. On the pocket, we made the time cycle of saum. I hope this help Sya to understand the terminology of fasting. She is learning to fast this year. She wakes up for sohoor and break her fast at Iftar. She followed what we did. So I am helping to explain the terminologies like when we sohoor, when do we stop eating, the word iftar and so on. The 3rdpage of the lapbook will be up on the next entry..
We made our very first lapbook!! 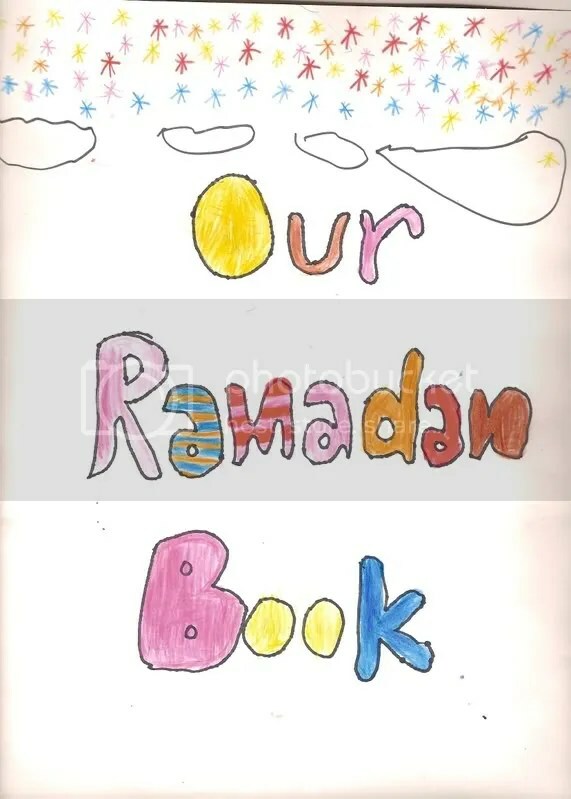 And what better timing than now to make a lapbook on Ramadhan. And then I was thinking of ways to summarise what we have learnt. So I browsed the good internet and found some ideas. Subhanallah! I thank Allah for he never forsake me. When I need something, he guide me to the resources. Syukur! Syukur! I made a lapbook! Our first ever! And it was all about Ramadhan (well at least the one that I manged to cover). First of all, the highest syukur to Allah for giving me the inspiration. Also before you go ohh ahhh, let it be known that it wasn’t my original idea. 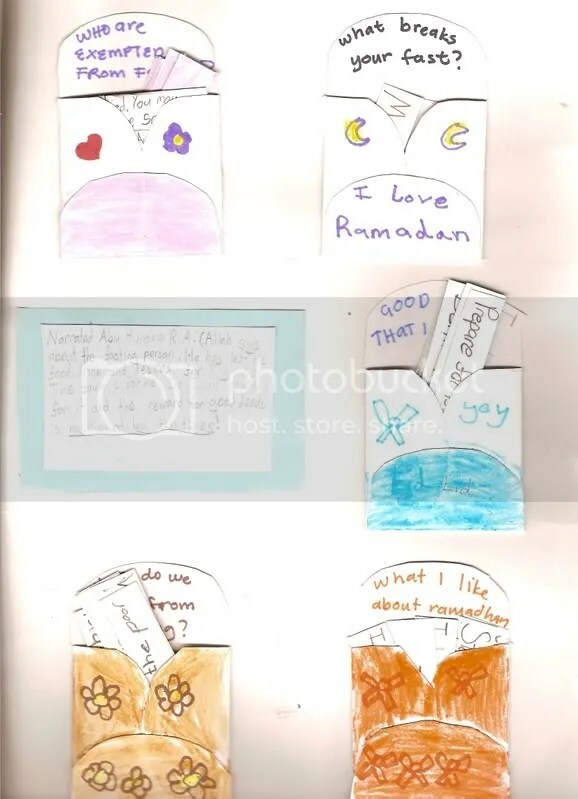 I actually used the ideas from this RAISING MUSLIMS. Well I changed some and added other little things which suited our lessons. But hey lapbooks are all unique after all. By the way do check out the link and you will find more exciting sites from there. Masya Allah! These sisters are really good and serious at their work. I learnt so much from them. May Allah bless them for the worl they have done and for the continuous ilmu they are spreading. I will try to explain the contents of our lapbook as much as I can. 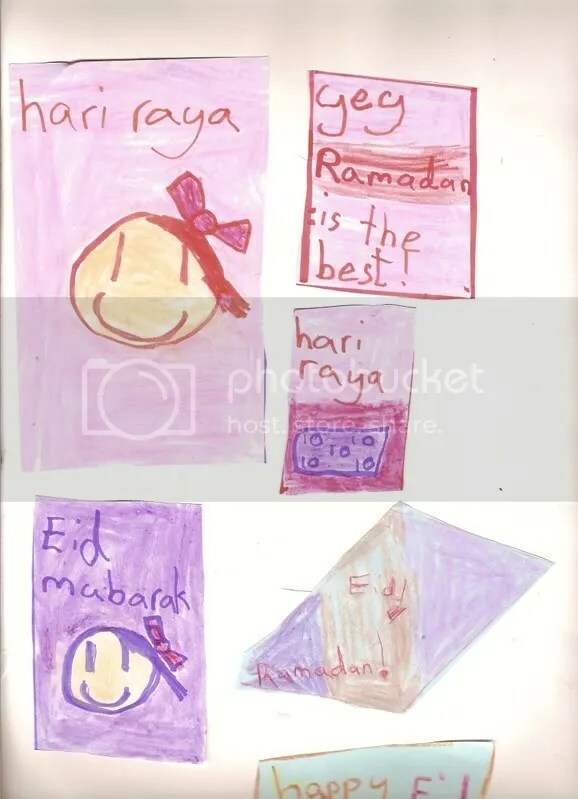 The cover page (top left) was designed by Sya. I made the outline of the letterings though. The top right is the last page. All those mini cards are made by Sya again without me telling her to do so. I think that’s a bonus to this lapbook. I also made a brief outline of the contents inside. On the first page, we pasted a flap asking why do we fast. And if you filp the flap, which will open up to a full moon, it will say because Allah tells us so. The kids simply love this. Even Zachary when asked why do we puasa, he would say because Allah tells us so. And we sometime shoot rapid question like this. haziq was asked to write down the Quran verse which is in Al Baqarah : 183. O’ ye who believe! Fasting is prescribed to you as it was prescribed to those before you. That you may learn self-restraint. You can see it if you pull the card. I made it accordian like. Again Haziq wrote this down. I made him read the Sahih Al Bukhari. Well only on that particular narration. Narrated by Abu Hurairah r.a., Allah’s messenger s.a.w. said saum is a shield from the hell fire. 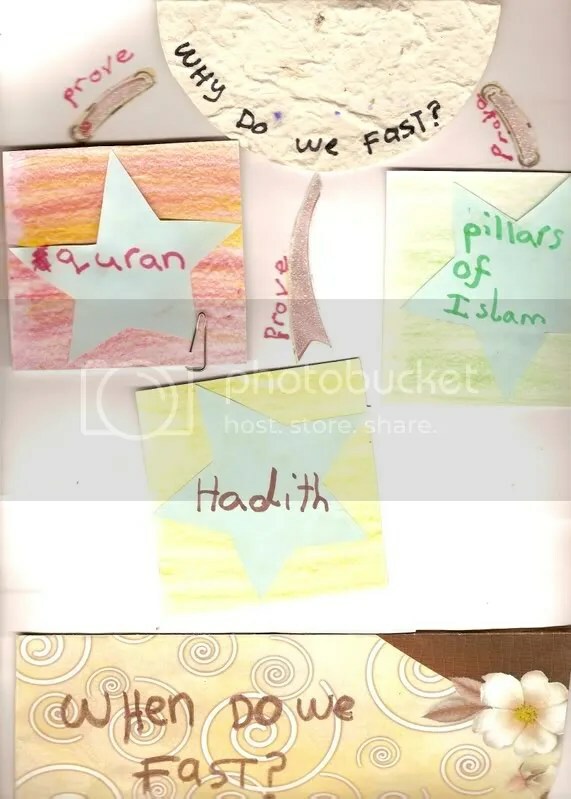 Sya was quizzed on this and she wrote down the 5 pillars of faith highlighting the fasting part. The last flap asked, when do we fast. And the answer as you know it is Ramadhan. This last flap will lead the reader to another section, which is the middle part of the lapbook. I will continue that in another post as not to overcrowd this one.